Expansive master bedroom with wrap-around balcony and spa ensuite. Enjoy the views from the main lounge, or venture out onto the large main balcony. Relax in your private spa bath and enjoy the wonderful alpine views. Upstairs and a downstairs bedroom works well for couples travelling with children or with other couples – everyone has privacy/space but can still relax together in the shared lounge room. No need to use the pricey mini-bar. You can utilise the fridge/freezer/microwave/oven/cooktop and dishwasher during your vacation. This is one of the biggest upsides. A stay at Alpen View will not confine you to a small bedroom. You can relax and unwind in large living spaces, or take in the incredible views out on the large balcony. Yes, it can be nice to have your bed made up every day at a hotel, but it can become intrusive when you want to relax or sleep and do not want to be disturbed. You also don’t have to be concerned about leaving out valuables, or worry that housekeeing will dispose of items that you actually want to keep – like expense receipts etc. Whilst most hotels will do your laundry for you, it can be expensive. Alpen View comes with a washing machine and dryer – which is very convenient – especially for the more adventurous travellers who often require a change of clothes more than once in a day! Imagine arriving to your accommodation in Queenstown to be warmly greeted and shown through the Villa. You’ll find the fire on, the wine ready to pour and if requested, the concierge has already done the shopping and stocked the fridge. 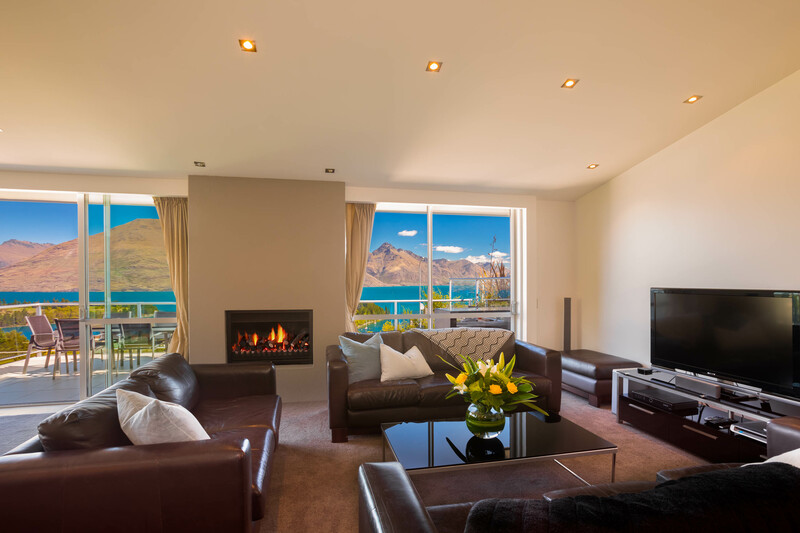 Enjoying a premium location on prestigious Queenstown Hill, Alpen View is the ultimate in luxury holiday home accommodation Queenstown. 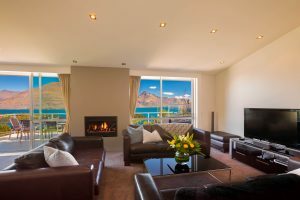 Alpen View luxury apartment accommodation in Queenstown NZ is fully serviced, very private, beautifully furnished and fitted out for your comfort. Styled for open-plan indoor and outdoor living, this spacious and sophisticated holiday home has an impressive architecturally-designed layout. 3 balconies and 2 courtyards take full advantage of the extraordinary views. The 4 bedroom 5 star holiday home is a contemporary home spread over 3 levels. 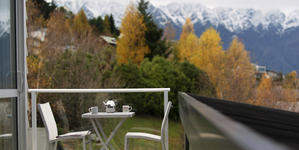 It is centrally located in town on prestigious Queenstown hill with unrivalled spectacular and uninterrupted views of the lake and mountain ranges. Each bedroom has a reverse-cycle air-conditioner [heat pump] and under floor heating if needed. Enjoy delicious coffee from the Nespresso coffee machine on the balcony in the sun each morning. At night, our team can arrange a private chef so you can dine whilst continuing to enjoy the spectacular views or, if you prefer, stroll down to the many bars, cafes and restaurants in town. What a perfect home in a perfect location for a long awaited family gathering – thanks for everything!! Thanks for a view of a lifetime our whole family will never forget! Fantastic house, great location, awesome view I agree, same time next year.